The JMRI SE8c programming tool lets you configure the internal options of a Digitrax SE8c Signaling Decoder Board directly from your computer. To open this tool from the JMRI start page select the Loconet tab and then find the tool on the drop down list. To use it, you put the address of an SE8c board in the text field and click "Read from SE8c". The tool will read back the current state of the various options, and set the check boxes to correspond to their current values. You can then, if you wish, change the checkboxes and click "Write to SE8c" to make your changes permanent. Because of the way the SE8c board works, this tool can't change the basic address of the unit. The SE8c can be configured to send Sensor status on the Loconet in response to a "track power on" command. The SE8c does not send Turnout status in response to a "track power on" command. 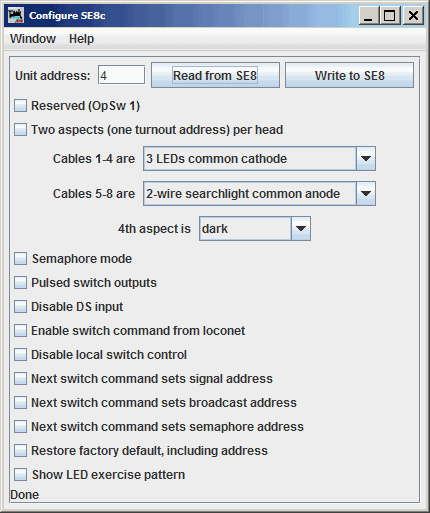 This tool is able to access SE8c boards with addresses between 1 and 36. Users are advised to avoid using the factory default board address (board address 1) as it will be difficult to program new boards with unique data if any in-service board is using the factory default board address. Documentation for the SE8c can be found at the Digitrax Web Site.